In concert with our PHE '93 25th Reunion, we will be paying lasting tribute to our spirited classmate, Laurel Fortin (nee Beatty), who we lost to cancer in May 2013. Our goal is to dedicate a tree on Queen's campus in Laurel's memory. All classmates, friends, and family, are asked to make a tax-deductible donation toward the $5,000 fundraising goal. Once the goal is met, we will move forward with the dedication. 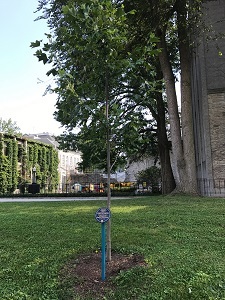 The gift to the Queen's Bench and Tree Dedication Program will include the cost of the tree, a commemorative plaque, a dedication ceremony and ongoing care. Further, it will support campus beautification and offer enjoyment for the entire Queen’s community. Should our class not reach the $5,000 goal, existing gifts will be allocated directly to the Campus Beautification Fund.